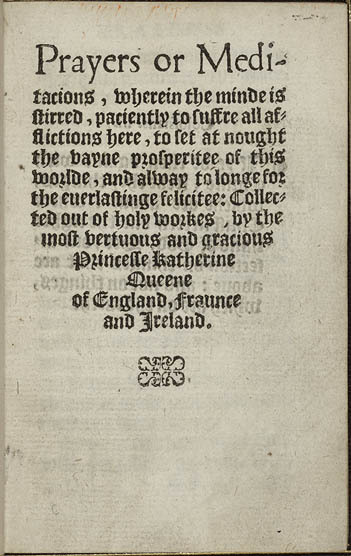 First published in 1545, “Prayers or Meditations” by Queen Katherine Parr became so popular that 19 new editions were published by 1595 (reign of Elizabeth I). 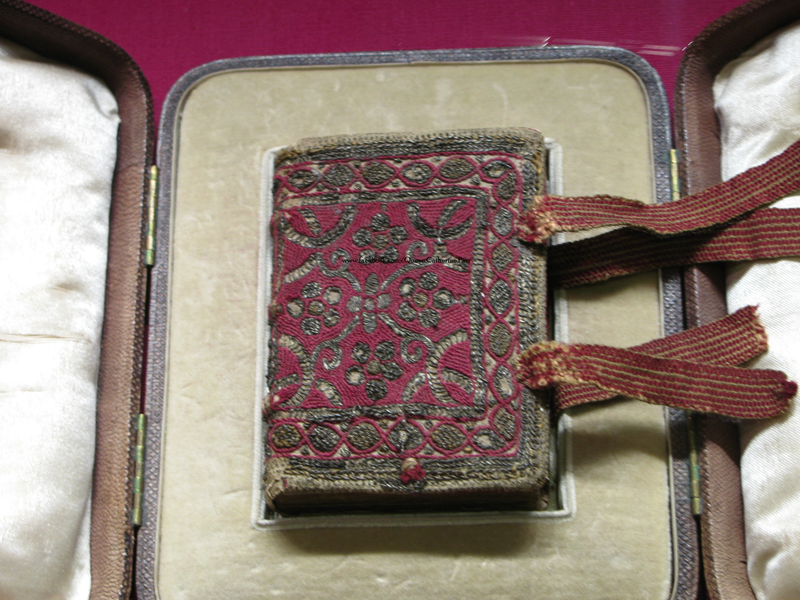 This edition was published in 1546 and bound by a cover made by the Nuns of Little Gedding. Located at Sudeley Castle, Winchcombe. Queen Katherine Parr published two books in her lifetime. The first, ‘Prayers and Meditations’, was published while King Henry VIII was still alive . Some sources state 24 April 1544 as being the day that the book was available. Catharine Parr, Queen, consort of Henry VIII, King of England, 1512-1548. Prayers or meditacions, wherein the minde is stirred, paciently to suffre all afflictions here, to set at nought the vayne prosperitee of this worlde, and alway to longe for the euerlastinge felicitee: collected out of holy workes by the most vertuous and gracious princesse Katherine Queene of England, Fraunce, and Ireland. An edition of: Prayers stirryng the mind unto heavenlye medytacions. D2r has an initial ‘O’ with a bird. Identified as STC 4821 on UMI microfilm, reel 678. Printer’s name and publication date conjectured by STC. This edition has a prayer for King Edward towards the end. Prayers — Early works to 1800. Harmsworth, R. Leicester Sir, (Robert Leicester), 1870-1937, former owner. STC 4824a, title page not for reproduction without written permission. Henry was said to be proud and at the same time jealous of his wife’s success. 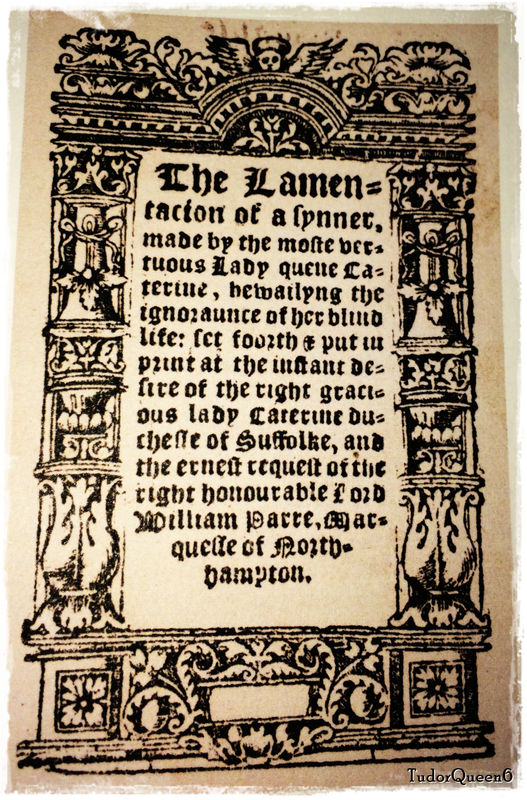 ‘Lamentations of a Sinner’ was not published until after Henry died [in 1547]. In ‘Lamentations‘, Catherine’s Protestant voice was a bit stronger. If she had published ‘Lamentations’ in Henry’s lifetime, she most likely would have been executed as a heretic despite her status as queen consort. Henry did not like his wives outshining him [i.e. Anne Boleyn]…hence her compliance and submission to the King when she found that she was to be arrested by the Catholic faction at court. Her voice may have been dialed down a notch, but once her step-son, the Protestant boy King Edward took the throne — she had nothing to hold her back. Her best friend, the Dowager Duchess of Suffolk, and brother Northampton encouraged Parr to publish. 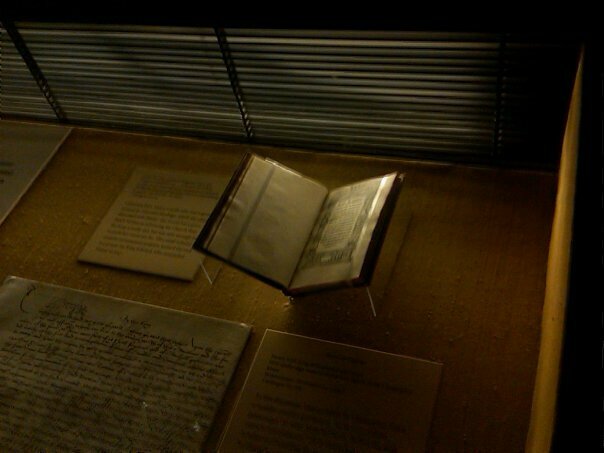 I was lucky enough to see a copy both a Sudeley Castle and at the Shakespeare Library in Washington, D.C.
Queen Katherine’s “Lamentations” on display at the Vivat Rex Exhibition at the Folger Shakespeare Library. Published in 1548 after the death of King Henry VIII, “The Lamentation of a Sinner” was Catherine’s second book which was more extreme than her first publication. She was encouraged by her good friend the Duchess of Suffolk and her brother, the Marquess, to publish.